Thelma Fern Hill passed away peacefully on Sunday, March 24, 2019, her 95th birthday, surrounded by her family at Van Diest Medical Center. Services in celebration of her life will be held at Our Savior’s Lutheran Church, 855 Main Street in Stanhope, on Monday, April 8, 2019 at 1 p.m., followed by refreshments at the church. Burial services will then be conducted at Graceland Cemetery in Webster City. Visitation will be held on Sunday, April 7, 2019 from 3-5 p.m. at Foster Funeral and Cremation Center, 800 Willson Ave., Webster City. 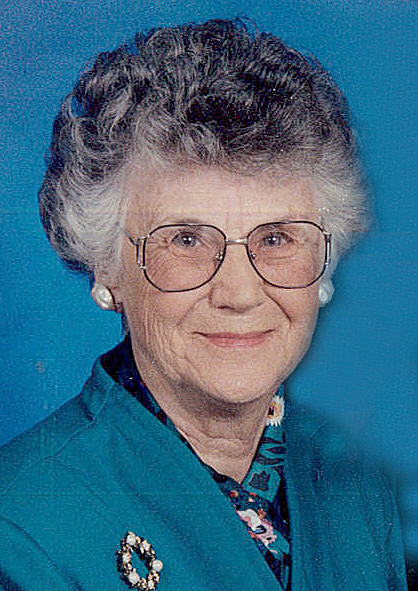 Thelma Fern Hill was born on March 24, 1924 near Williams. She was the daughter of Fred and Tillie Johnson. She was baptized, confirmed and a lifelong member of the Lutheran church. In 1941, she graduated from Radcliffe High School and continued her education at Iowa State Teachers College in Cedar Falls. After college she taught at an elementary school in New Providence. She married Neel Hill on April 6, 1946 and moved to a farm near Stanhope. For over 65 years she was active in Our Savior’s Lutheran Church. In addition, she volunteered at her children’s schools in the Stanhope and South Hamilton Community. In the late 1960’s she returned to teaching as a teacher’s aide in the South Hamilton middle and high schools. Neel and Thelma spent many winters in Texas. In 2008, she moved off the farm and into Crestview Apartments in Webster City. Her hobbies included playing bridge and board games, needlework, cooking and making kringla for her grandchildren and great grandchildren. Preceding her in death was her husband, Neel Hill; son, Kirk Hill; sisters, Verdelle (John) Brattebo and JoAnn (Calvin) Chalfant; brother, Fred (Helen) Johnson, Jr.; sister-in-law Mary (Marvin) Davis and her brother-in-law, Jim (Betty) Hill. Survivors include her daughter, Neela (Bob) Kottmeier and her sons, Frank (Linda) Hill and Kenn Hill. She is also survived by her grandchildren, Rob (Katie) Kottmeier, Sarah (Shep) Hickey, Leanne (Mark) Carlson, Keenan Hill, Ethan (Taylor) Hill, Isaac (Brooke) Hill, and Chris (Rick) Lawson and her great grandchildren, John and Lila Kottmeier, Shep and Beckett Hickey, Henry and Nora Carlson, Abby, Emma and Charlie Hill, Everly Hill and Lance Lawson. Additionally, she is survived by her brother-in-law, Gene (Kathryn) Hill and many nieces and nephews. The family wishes to thank all of Mom’s friends and family who visited so faithfully and helped her during the last years of her life. We also want to recognize the members of the staff at Crestview Apartments, Crestview Nursing and Rehabilitation and Van Diest Medical Center for their services and acts of kindness to our mother during the last weeks of her life. Memorials may be sent to the Stanhope Community Library, Our Savior’s Lutheran Church in Stanhope, or any charity of your choice.